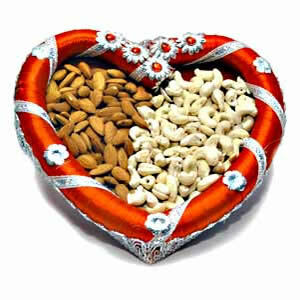 This is lovely heart shaped tray is filled with 400 gm dry fruits in a combination of almonds and kajus (200 gm each). The tray is beautifully decorated and can be sent as a gift to your loved ones in all cities in India this festive season. Send this and more Gifts across India to your beloved ones through GiftsAcrossIndia.com for a secure and speedy delivery.